1. Preheat oven 350°F. Spray rimmed baking pan with nonstick cooking spray. Cut crosswise slices, about 1/4- to 1/2-inch apart, into each potato, cutting only 3/4 of the way through potatoes. Rinse potatoes under cold water. 2.Place potatoes, cut side up, on prepared pan; brush cut sides of potatoes with oil and sprinkle with salt and pepper. Bake potatoes 1 hour. 3.Preheat broiler. 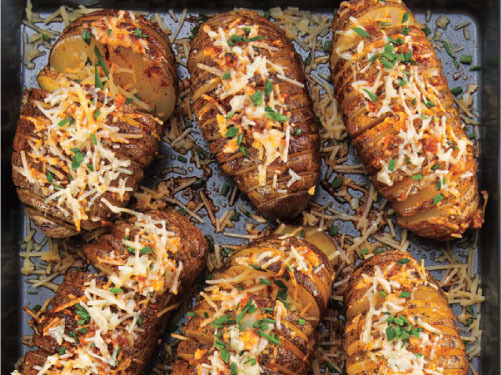 Evenly spread potatoes with butter, and sprinkle with garlic, cheeses and paprika; broil 5 minutes or until cheeses melt. Serve potatoes topped with chives.